My daughter came over yesterday and had this with some tuna on top. Love avocados. We put avocado on BLTs and grilled chicken sandwiches. Avacado: on a spoon, toast,tuna, taco. Salad, it really doesn't matter always a good idea. Want to use avocados, buy as a household of one, my problem with avocados is how do you store them when cut and you don't use it up. They never look appetizing the second day. Guess I spoke too soon - I'll try the 'leave the pit in' idea. Linda store with the pit in place and wrap tightly in plastic wrap. Also you can brush some lemon juice on it. Avocados are like bananas as far as deterioration rate. I've never had luck keeping them past the moment unless either in the half shell w/pit or mashed with lemon juice. Even that doesn't last long enough! I love avocados halved with a spoon of salsa, wish they weren't so expensive! I love avocado on toast, but I also want to give a huge shout-out to coconut oil on toast! I've found that if I'm craving buttered toast, coconut oil is just the thing. And there is so much research coming out now showing that it's super healthy and even helps you lose weight. So if you like coconut, try that one too!!! I also use it to make grilled cheese. at eat this at least twice a week, easy and good. 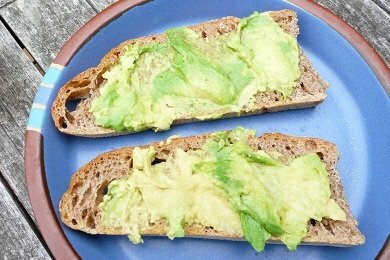 toasted Ezekiel sprouted 100% whole grain bread, tsometimes with a vegan mayo, half of an avocado sliced ( leave other half for next day in peel in air tight container,I will have to try leaving the pit in ) slice tomato, then toasted raw almond slices. Sometimes I add spinach, or lettuce. I personally can't stand avocados, but I'm glad I can still have heart-healthy good fats in the form or real, grass-fed butter. I personally can't stand avocados, but I'm glad I can still get heart-healthy good fats in the form of real, grass-fed butter. one of my favorite breakfasts is toasted Ezekiel Sprouted bread with avocado, sliced tomato, spinach and a poached egg! I personally can't stand avocados, but I'm glad I can use real, grass-fed butter. I love avocado on toast. I usually sprinkle mine with a little garlic powder to make give my morning a little savory kick. @Diana - that is a real plate. I do this all the time! Good job spreading the word! I also add scrambled eggs on top too! YUM! I LOVE AVOCADOS!! I eat it every chance I get. I put avocado in our salad every night. Read it has enough fiber for the day in one avocado - or something like that. If it turns brown in the refrigerator by the next day, just cut it off - eating it brown on top doesn't bother me. We always leave the pit in and coat with lemon juice, but it still turns brown -doesn't change the taste.